I find ethics to be very important, and that means I haven't tried to monetize this blog that way others might. It would be too much of a conflict of interest. 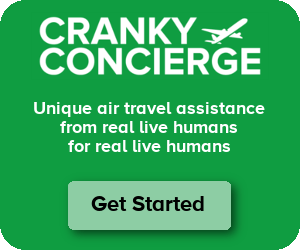 That reality made me think hard about what I could do, so I created Cranky Concierge air travel assistance. This business has done very well and that has allowed me to keep writing the blog. Every so often, we come across a problem with a client that I think is worth telling publicly. That's what you'll find in this section.